Please look after this valuable gift carefully and treat it just like cash. The amount redeemed from an eGift Card will be shown on the till receipt for each in store transaction. No change will be given but the balance may be applied to future purchases. Keep this eGift Card secure and bring with you when returning any items purchased. Ernest Jones reserves the right to amend these Terms and Conditions from time to time, to view the full Terms and Conditions, click here http://www.ernestjones.co.uk/webstore/static/customerservice/services/giftcards.doErnest Jones Gift Cards or Egift Cards cannot be used for the purchase of the following prestige watch brands: Breitling, Omega, Tag Heuer, Longines, Cartier, Tudor, Zenith, Bremont and Jaeger LeCoultre. This renowned jeweller and watchmaker has captured the hearts of the British public since 1949 where it first started with a single London store on bustling Oxford Street. To receive an Ernest Jones gift card is a joy, letting you delve into a range of quality and refined jewellery from one truly heritage brand. Now with more than 180 stores, you’ll find a catalogue brimming with all of your sparkling desires at Ernest Jones. Find stunning diamond bracelets, earnings in precious metals like gold, silver, contemporary rose gold and more - let another indulge with a designer watch, or even a personalised piece to make this gift really memorable. 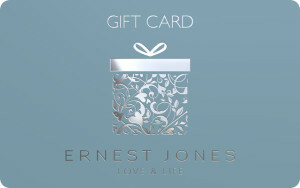 Ernest Jones gift vouchers will speak for themselves and deliver the sweetest of possibilities to adorn every special occasion. So for an anniversary, birthday, Christening or just because - make the moment beautiful with Ernest Jones.